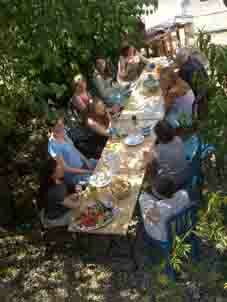 In 2003 Andrew and Lucy bought a house in Marnaves, a tiny village outside Cordes-sur-Ciel in the Tarn (81). Toulouse is about 80km in a south-westerly direction, mostly by motorway; Albi and Gaillac each about 30km, east and south-east; there is a train station only 3km away. 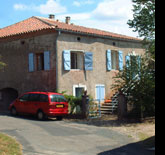 Andrew's sister Julia has a house in Labarthe-Bleys, the next village. The house is old and originally a simple farmhouse. Its startling feature is an enormous barn, more than half the size of the building (15 x 6 x 6.5 metres high). The domestic section is almost complete after major rebuilding work and the barn is finished, a superb space in wood with a hemp wallcovering, a warm space with a fine acoustic for music. It was used for the first time in summer 2008 for period string course (see link below). An organ by the London maker Robson (c1835) is in the barn and playing well. We are happy to rent out the house at reasonable rates.